I've purchased lottery tickets exactly three times in my life. Each time, I was seduced by a large jackpot and was in dire financial straits, and rationalized that spending a buck on a SuperLotto ticket was worth the risk. My net winnings were a grand total of five dollars, so at least I didn't lose out — unlike the vast majority of people who take their chances in the lottery. This week, with a Powerball jackpot of $1.5 billion, the largest in history, I'm not the only one eyeing the change jar thoughtfully, wondering if I should put in for a ticket or two. And that's the whole point of the lottery: to convince people that they're somehow going to beat enormous odds and land in the lap of luxury. Most of those people are members of the working and lower class, fed the idea of the lottery as a way to find the American Dream. The lottery may just be one of the greatest frauds ever perpetrated on the American lower class, called by some a "tax on the stupid," but that's a mistake — it's not stupidity that drives people to buy lotto tickets, as the statistics are readily available, but rather a naive hope that someone has to win, so it may as well be you. It's really a tax on the poor, preying on the dream that you could be a winner, that the lotto will transform your life. Maybe for upper middle class and upper class people, that kind of logic seems bizarre, but they've never experienced the grinding, relentless poverty that drives many lottery players to do things like foregoing groceries to buy tickets. 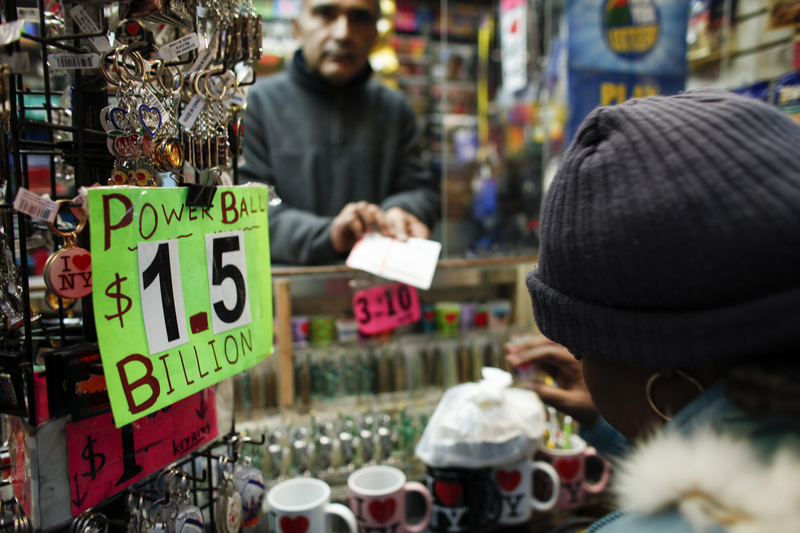 Low-income people buy the majority of lottery tickets. Lottery advertising is heavily weighted towards poor neighborhoods, and state lotteries use tactics like increasing the odds of small prizes to encourage people to come back for a second round. Nearly everyone who grew up poor or working class can tell you about their childhood lottery fantasy, and many of us had dreams that could seem totally mundane to the upper classes. I remember wanting to use my imaginary lottery winnings to buy a modest house, health insurance, and a retirement account. At 10 years old. The lottery deliberately sold cotton candy dreams to all of us, with its famous "What's next?" billboards and advertisements featuring contented lottery winners encouraging us all to give it a go. The lower classes busy themselves buying lottery tickets in the face of grim facts on social mobility in America, perhaps unaware that the income gap is growing, trapping people in poverty because they can't afford better educational and social opportunities. The Brookings Institution notes that the bootstrapping myth — that work will get you everywhere — doesn't play out in reality. The leading predictor of mobility is how much money you have to begin with, and the distribution of wealth between rich and poor. And so, low-income people buy the majority of lottery tickets. Lottery advertising is heavily weighted towards poor neighborhoods, and state lotteries use tactics like increasing the odds of small prizes to encourage people to come back for a second round. Liquor and convenience stores count on lottery revenues and advertise heavily to their customers, and are more common in low-income communities where food deserts ensure people are often in corner stores for basic necessities like bread and milk. Low-income, undereducated people of color are much more likely to buy tickets, and they end up trapped in a cycle of playing over and over in the hopes of finding the big ticket. Lottery gambling is also a leading cause of calls to gambling hotlines. In October of last year, the lottery consortium actually leveraged lottery pipe dreams to its advantage by increasing the number of available numbers to play, making it more challenging to pick a winning number, in the hopes of creating precisely this kind of astronomical jackpot. Wall to wall lottery coverage is everywhere in the media this week, the kind of advertising money can't buy, enticing people to pop in to the corner store after work, or grab a few more tickets for the office pool, because what do they have to lose? Well, potentially quite a lot, because Americans spend $70 billion on lottery tickets annually. That's more than movie tickets, books, games, and sports tickets. Combined. The lottery is a behemoth industry and it entices participants further with claims that the money goes to governmental endeavors like education, which people use as a justification for buying tickets — that $10 goes to buying pencils for students, right? Actually, that money might be used to fund budget gaps that have nothing to do with education, because it's easy to shift funds as needed. Districts that use lottery money may also experience considerable funding fluctuations, which causes budget cuts — leading to larger classroom sizes, diminished curricular choices, fewer school supplies, and other shortfalls. In many cases, lottery money is just used to replace existing funding, so it doesn't result in any net change, but once lottery income drops, schools can be left holding the bag. The Roman poet Juvenal wrote of panem et circenses — bread and circuses — commenting that the restless Roman people were placated by provisions of comforts from the Empire, ensuring that they didn't rise up. The lottery is the modern-day version in America, where gaping class inequality is painfully obvious, but the lower and working classes have remained largely quiescent thanks to the scraps thrown their way. The lottery is a distraction — and we're all letting it work.